One of the joys of the original Anchorman was seeing Will Ferrell wrangle the best comedic talent in the business into one absurdist fable. Not only was the core team one of funniest of ensembles of all time, but the movie was littered with cameos. And they worked — the news anchor rumble is sublime comedy cinema. Judging from casting reports arriving from the set of the long-awaited sequel Anchorman 2, Ferrell may have been able to work his contacts yet again to fill the follow-up with an all-star cameo cast. Is there some sort of Hollywood Linkedin that makes this all possible? The latest addition to Anchorman 2 is one of Ferrell’s former costars, but not one of the overtly funny ones — adding charm to her inclusion. Who is it? Possible spoiler of Anchorman 2 coming at you. According to The Hollywood Reporter, Nicole Kidman has shot a cameo for Anchorman: The Legend Continues, reuniting with Ferrell, her Bewitched costar, for a secret role. There’s also no word if she’ll be wearing her fake nose from The Hours for an arbitrary reason. RELATED: Is ‘Anchorman 2’ a ‘Morning Glory’ Sequel? Along with Kidman, Harrison Ford has also filmed a brief role for the sequel, and anchorman deathwatch combatant Vince Vaughn is rumored to be returning as well. As was the case with Anchorman, there may even be cameos the Internet isn’t able to hunt down before the movie hits theaters December 20, 2013 (implausible, but possible). With so much star power being primed for the sequel, Ferrell and his Anchorman director Adam McKay make a gamble. An array of cameos worked for the first movie, which had a cool opening in theaters before catching on as a cult hit. People discovered the movie, and in turn, the random actor appearances that flurry the film. Replicating the recipe for Anchorman 2, and with bigger stars, is tricky. There’s an event horizon for the tactic — one too many cameos and suddenly, the movie is limping with a crutch. The cameo is the trickiest gag to pull off. The goal of a celebrity’s inclusion into the fictional world is essentially to pull the viewer out of the movie. A famous face walk-on raises awareness that what you’re watching is completely fake and that recognizable people are in on the joke. A well-timed cameo can be hilarious — “Oh my gosh, they got that guy!” They can also be… less effective. While basketball star Patrick Ewing showing up as an Angel in The Exorcist III was likely meant to pull the rug from under us, adding a mind-bending element to the movie, it plays as goofy. The same fumbling can occur in comedy with significantly less laughter. Ewing’s The Exorcist III appearances may have been palatable (emphasis on “may”) had it not been for a clutter of other cameos around it, including Samuel L. Jackson, Larry King, and Fabio. It entered gimmick territory. That works for some movies: it was a selling point for 1956’s Around the World in Eighty Days (Frank Sinatra! Peter Lorre! Cesar Romero! ), and became a point of world building for Robert Altman’s showbiz-driven The Player and political comedy Dave. Spike Jonze’s Being John Malkovich took the “realism” aspect to the next level with: The movie required cameos just to make it believable that John Malkovich felt like a real character. Seeing Brad Pitt vouch for the thespian and Charlie Sheen appear as an old friend added gravity to the drama. Inversely, cameos don’t have to make sense to work. Anchorman is a prime example, along with every Saturday Night Live movie ever made, and another non sequiter classic, Zoolander. But these movies weren’t building off the success of a similarly patterned predecessors. The “lighting doesn’t strike twice” fear of Anchorman comes from 10 years worth of investment on the parts of fans. 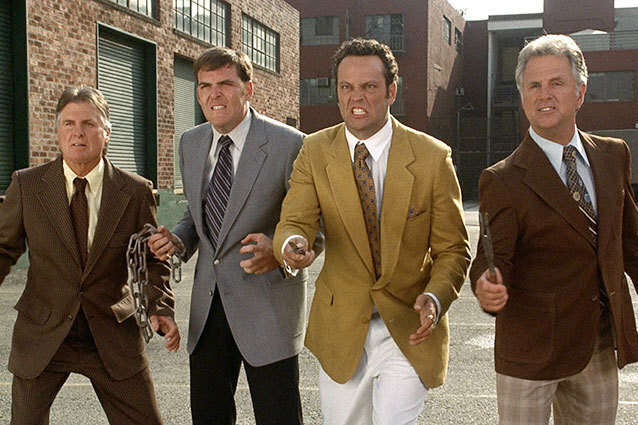 Anchorman 2 requires cameos — it’s a defining part of the original — but risks having too many, being too random, feeing disingenuous to the frat house feel of the first movie. If there is any franchise that gives us blind hope for Anchorman 2‘s delicate use of cameos, it’s the Muppet movies. Jim Henson and his crack team of filmmakers worked magic with big name talent, their appearances always complimenting the Muppets rather than stealing the spotlight. Rounding up Steve Martin, Bob Hope, James Coburn, Madeline Kahn, and Orson Welles could be a lame attempt at earning cred, but by lowering their status (the celebs always played second fiddle to the puppet stars), it lampooned what we knew about them. Anchorman 2 has the heightened world to play like the Muppets. If you’re going to put Kidman in your movie, push her further than Hollywood has allowed her to go. Maybe bringing back The Hours nose isn’t a bad idea. So how many cameos is too many cameos? What cameos work and which ones fall flat? Name the best and worst in the comments.